The 4 Umbrellas make up the backbone of what The PE Umbrella represents and stands for. …It was in one of my early interviews with Bob Knipe that we hit on the topic of WHY I chose the name ‘The PE Umbrella’ for my podcast. My response was simply that PE covers so many aspects of life and skills, it was an Umbrella term for many things. Bob went one better than me. He suggested that he had imagined the term as a metaphor. An Umbrella that children, and later adults would carry with them through their lives, containing skills and knowledge that protect them from the world around them and situations they may find themselves in, as a real umbrella shelters an individual from the rain. Later, while mulling over this concept, I took it one step further, and instead of an umbrella that simply protects them, it is one they always add skills to, and can choose when to use these skills to tackle the world around them head on! And so the 4 umbrellas was born. Each Umbrella representing one of the four domains of learning. I see Physical Education as being at the forefront of the education & development of all children. The Physical has never been/nor should ever be in my eyes the sole focus of a great Physical Education program. Lessons can and should use purposeful questioning that enables the children to reflect on WHAT they are doing, WHY they are doing it and HOW they will know they have achieved it. 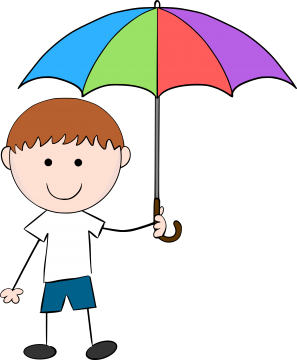 Almost every activity has the potential to explore all 4 of these Umbrellas, and the resources at the PE Umbrella explain just how the same activity can lend itself to learning in any of the four domains, whether you choose to focus solely on one or touch upon a number of them, well, thats entirely up to you. After-all, YOU are the teacher and YOU know your students the best! 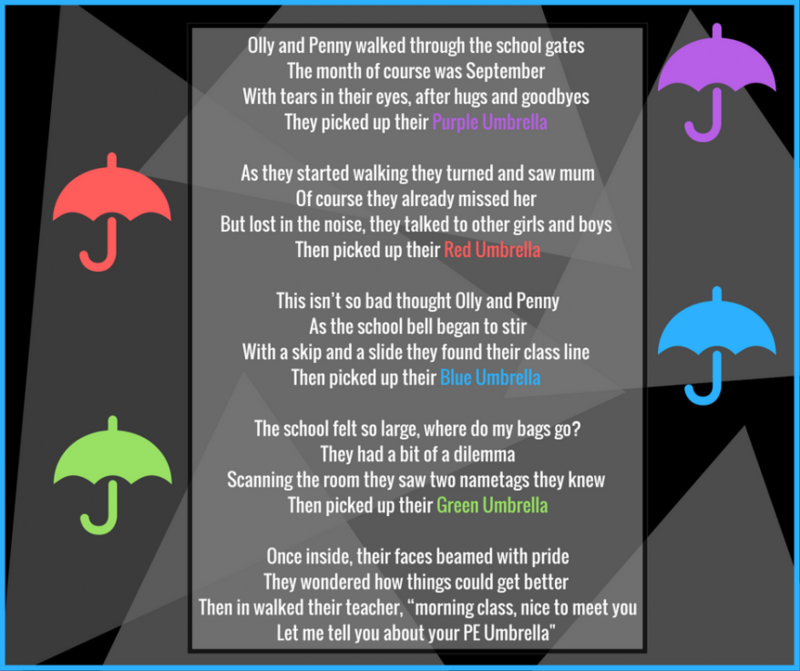 Inspired by my own two children, this poem reflects their first school days… think of the potential each and every child has when walking into your classroom with their own 4 umbrellas!